your dreams. Our consultants will help choose from our top designers. From short to long, in an array of colors, we have something for every bridesmaid, that will fit your budget. The latest fashions and the hottest designs from the runway you will find here at an unbelievable price. Welcome to your first step down the aisle! Welcome to Carolina Bridal World where you will find only nationally advertised designer wedding dresses portrayed in 2 locations combined with over 27,000 square feet of bridal bliss. We are a family owned and operated business since 2002. We are well known for our outstanding customer service. With spacious dressing rooms, we can accommodate your entire wedding party. We have a large selection of wedding dresses including plus size, vintage, and lace. Our wedding dresses feature styles from simple elegance to an exquisite ball gown ranging in sizes from 4-32. We also offer a variety of bridesmaid’s gowns, flower girl dresses, mother’s dresses, and tuxedos to complete your wedding party all in one location. We are conveniently located next Carolina Premium Outlet Center in Smithfield, NC off I-95 exit 95. The Burlington, NC location is conveniently located off exit 143 next to Burlington Coat Factory and Northern Tool directly facing I40/85. We make your shopping experience easy with no appointment required. We are open 6 days a week in both locations. We guarantee you will find your dream dress at an unbelievable low price. 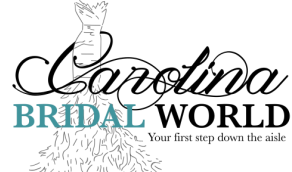 We look forward to you making Carolina Bridal World “Your First Step Down the Aisle.”​Carolina Bridal World is a full service bridal salon that DOES NOT require an appointment to shop! Stop in at your convenience and be amazed at our spectacular selection of wedding dresses that are sure to fit any budget. "Thanks ladies for the wonderful service you game to me and my bridesmaids. We really enjoyed the experience and thanks for helping me choose the dress for me!!! You are the BEST!!! :-)"